What I bring to the art world as a Canadian artist is my idiomatic perspective on Surrealism. Dubbed by some as Bubblegum Surrealism or Pop Surrealism, I use the form to convey ideas in a pictorial and symbolic way using our rich visual culture to pull from. Often borrowing from nursery rhymes, Mother Goose and Grimm’s Fairy Tales, I take imagery of established conventions of childhood story telling and update them into adult themes. In the above image I have clearly appropriated the image of Humpty Dumpty. His frail frame and cautious life-under-threat existence is the perfect emblem for the existential human. In this situation he is not perilously teetering on a wall but safely enthroned on a cushioned chair. The real threat comes from the enraged monstrous head that is either poised to bite or is actively screaming at poor Humpty. 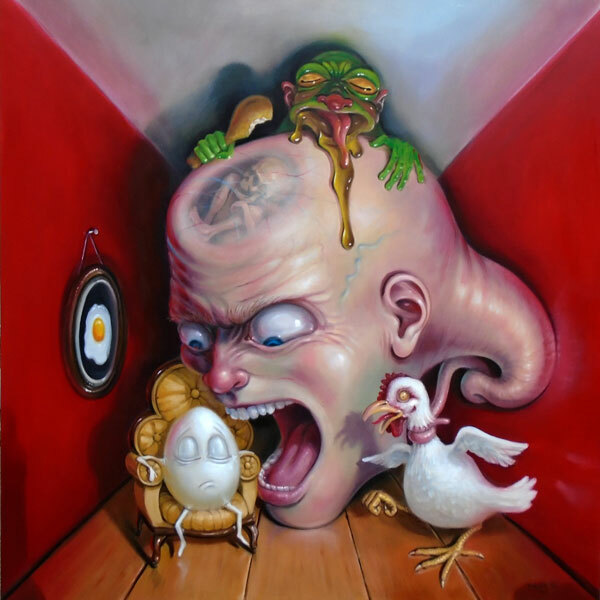 The head-monster is strangling a chicken (old school end-of-life method for chickens) while in his skull gestates an embryonic spectre of death which opposes the potential of life-the standard symbolism associated with growth in the womb or within an egg. To make matters worse, there seems to be an even more repulsive monster consuming a chicken leg at the top. On the wall hangs a portrait of a fried egg which brings the chicken/egg theme full circle. Like some ancestral painting it immortalizes an egg in an aborted stage of development. While Canada may be best known for hockey, maple syrup and poutine it also has a rich history in the arts and literature as being a detached point of perspective from which to do profound field studies on the United States. As the nearest sibling to America, Canada has been infiltrated by its culture, invaded by its advertising, amused and confused by its politics and saturated by its media. Where better than to observe the crucible of western culture and watch it bubble over…? 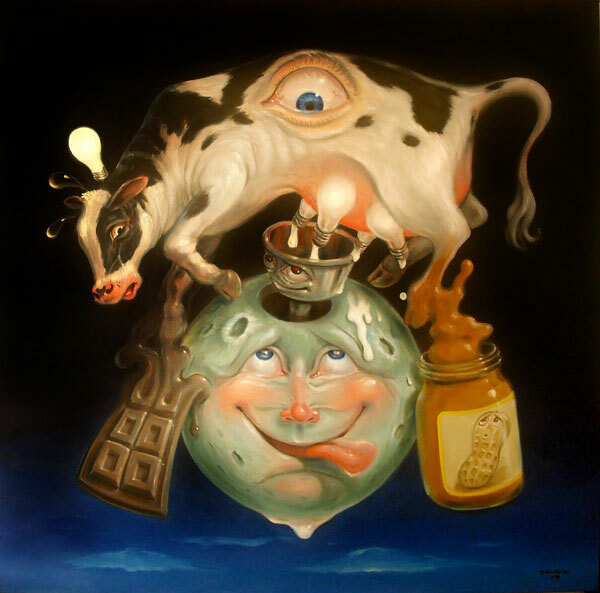 Bubblegum Surrealism: Stephen Gibb – Artist Statement, pop surrealism canada, canadian artist. My artwork weaves an eclectic tapestry of cultural and social influences. At one moment it may make a surreal single-punch-line comment on Canadian pop culture while the next it may construct a complex and playful diorama of surrealism probing into the outer perimeters of human nature and surrealism. be. It is in this realm, theoretically, that the mind’s gamma waves are super-stimulated and brain activity resembles fireworks. I resolve that this accounts for the broad reactions my work garners from observers, that ranges from contemptuous dismissal to enthusiastic exuberance. We are all wired differently. The medium is the method, which has been a faithful deployment of oil painting and traditional Surreal Canadian Artist techniques, such as glazing and the occasional dalliance into chiaroscuro. The richness achieved by layers of thinned oil paint on MDF panels always adds an interesting luminous quality to the final piece. concept dictates subliminally as to how the composition manifests itself. Canadian Artist see for more Canadian pop surrealism. 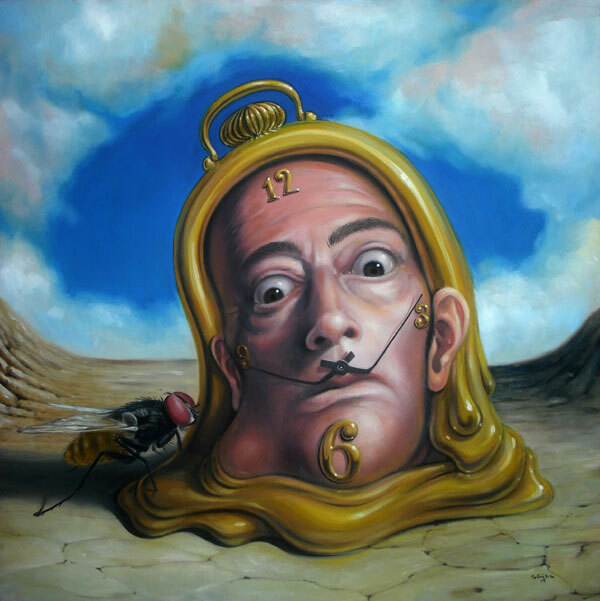 This entry was posted in Canadian Artist, Canadian Surrealism and tagged canada, canadian, canadian art, canadian artist, canadian pop art, canadian pop surrealism, canadian surrealism, painter, pop surrealism, pop surrealism canada, stephen gibb, steve gibb, surrealism. Bookmark the permalink. Both comments and trackbacks are currently closed.